A New Level Of Security & Safety. . . The OmegaGPS digital tracking system is an internet based GPS tracking system that maps the location, speed, and direction of your vehicle, anywhere, nationwide. Click the button below to view a tutorial on using the primary functions of the OmegaGPS website & interface. When a loved one is late or unaccounted for, you can find the exact location of their vehicle to verify their safety. SPEED TRAP - alerts you if your vehicle exceeds a pre-selected speed, to warn of dangerous driving. GEO FENCE - can be used to set a perimeter around any location and alerts you if that perimeter is crossed. Hi-Tech With A Personal Touch. . .
Live support specialists, and enhanced, optional services like PERSONAL ASSISTANT and THEFT RECOVERY ASSISTANT make using your system stress free. 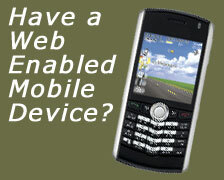 Opera Mini web browser is compatible with any JSR-75 enabled phone and allows use of OmegaGPS.com functions. Track your vehicle on the go!